Ah, and breathe a sigh of relief. After the perfect wedding – well, the perfect wedding to us, the necessity to fill days with crafts, budgeting, alcohol tasting and web surfing is over. I’m not saying the desire is gone, nor that those actions have entirely ground to a halt (the third one especially), but we have other options now. And, I can go back to exploring America, and satisfying my ADHD-related novelty seeking urges. With the benefit of a loving husband at home. In the words of Charlie Sheen: “Winning”. First up: my first ever baseball game. So, my friend and fellow blogger and America-explorer Dom is in my office on Friday, mentioning that he was planning a trip to see the Braves, and trying to get people on board. ‘Err… well… if there’s space, you know.. and tickets… and er….’ I stutter. Dom looks in disbelief ‘you’re up for it?’ of which I believe the direct translation is “so, the girl who needs 3 months notice to go for an after work drink is dropping everything at 36 hours notice to jaunt to Georgia at 36 hours notice at grant time?” Like I said, I’m back. So off we went. 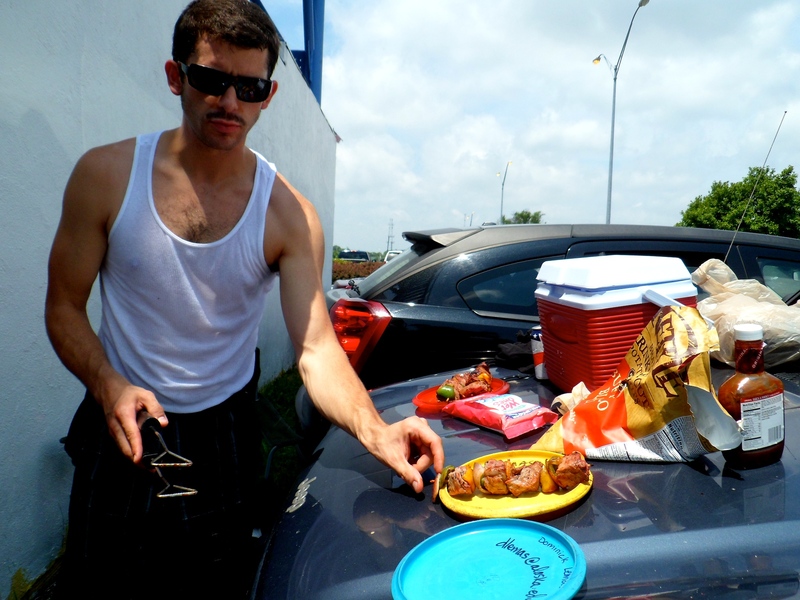 We had my first experience of tailgating, which was awesome. We also sadly had not my first ‘you can’t buy alcohol on a Sunday’ experience (WTF? Didn’t Jesus create wine from water? Shouldn’t water be banned and alcohol mandatory?). But other tailgaters were more than happy to share their Bud with the boys, while I quietly consumed my bottle of Chardonnay. Which, in 100 degree heat with no breakfast, may have been a mistake. But hey, we live and we learn. Onto the stadium, in my newly borrow wife-beater: it was huge! And had so many shops and restaurants and lit up signs. It was like a mini city. We went in the pitching tent (I was rubbish, but want another go) and bought Braves swag (me: a cute vest top to please left-behind hubby; Matthew: a hat), bought more alcohol (of course) and sat in the blazing heat to watch the game. It was fun, and I started to get the rules. But the alcohol didn’t help (I would definitely either eat more food and drink more water, or just drink less wine next time). And 2-hours later it was time to get back for Father’s day. A drunken sob in the back, a long sleep, a few moment of incoherent chatter and I was delivered back home, sunburned, hungry and very sleepy. Want to go again! Thank you Matthew and Dom for an awesome day, and another American experience ticked off (Matthew was also responsible for my first ever football game – which was even more awesome). 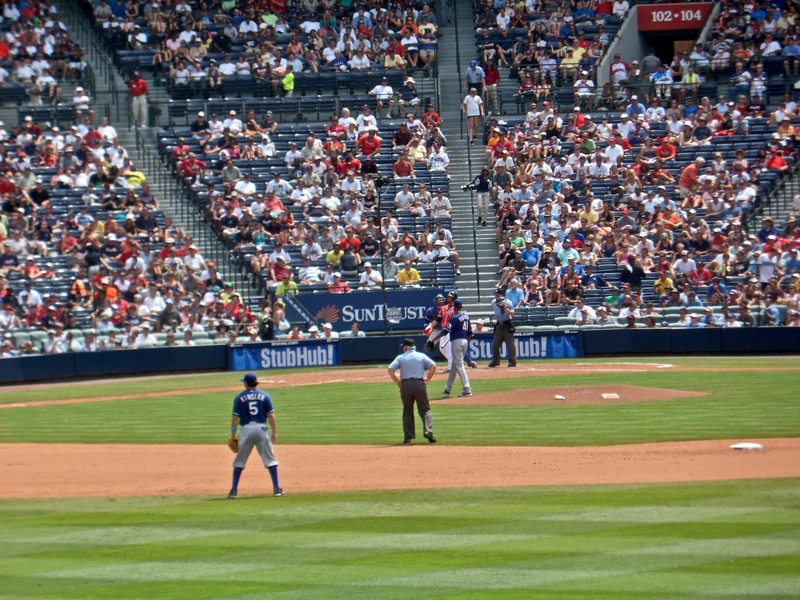 This entry was posted in Life, Travel and tagged American things to do, baseball, drinking, Georgia, roadtrip, spontaneous adventures, sports, Travel on June 24, 2011 by Me.